Recollect 1960: a time when many artists were courting Eastern thought and deconstructing western literary formalism. Enter Margaret Avison, a poet’s poet, a metaphysical poet, perhaps an academic poet lauded for her sometimes difficult but indelibly rich and intricately woven language. That year, her first book, Winter Sun, was awarded the Governor’s General Award. Then, in 1963, she became a devout Christian following a conversion experience. Margaret Avison published seven additional collections, the last following her death, in 2007, at eighty-nine. While not an exceptionally prolific writer, and one who certainly swam against the tides of prevailing artistic metaphysical thought (or lack thereof), Avison is considered to be an important Canadian poet, one of the first to bring modernity to Canadian poetry, and singular among poets for her particular diction, imagism, and rich use of word compounds and synaesthesia. Consider, “Smell a saucepantilt of water / On the coal-ash in your grate” (from “Thaw,” Winter Sun, 1960). 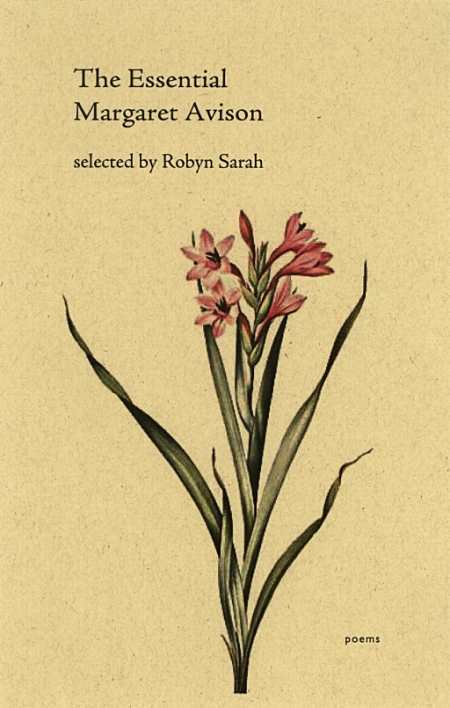 This latest collection of work selected by Canadian poet Robyn Sarah attempts to cull a lifetime of work into a mere fifty pages of poetry text and is rewarding in its success. Though Sarah has arranged Avison’s collection in chronological order of publication, an argument might be made that readers new to Avison may find it helpful to read the book in reverse order, back to front, then back again. Though her early work was hailed by some to be her best, Avison felt the “difficulty” of it as a shortcoming, and worked toward greater simplicity and clarity later in life. This is not to say that the late work is overly simplistic or lacking in the imagistic and linguistic riches of the earlier, but it is more immediately accessible. Moreover, themes in the early work are echoed later, such that entrance to the early work is widened after familiarity with the late. Avison’s virtuosity harkens back to seemingly disparate poets in her own distinct timbre; in formal consciousness, and resonance with a deep metaphysical stillness, T.S. Eliot may come to mind. Again, from the poem “Thaw,” the opening quatrain*: “*Sticky inside their winter suits / the Sunday children stare at pools / In pavement and black ice where roots / Of sky in moodier sky dissolve.” Richly imagistic and occasionally colloquial, particularly in the later poems, echoes of Eliot’s foe William Carlos Williams may also be heard, as in the poems “Cement Worker on a Hot Day” and “Scar-face.” One thing is certain, no matter the reader’s religious persuasion, there are riches to be had for whomever devotes time to The Essential Margaret Avison.